Spice up your mid-week meal with Kancha Lanka Murgi/ Green-Chilli Chicken! Vegetable vendors in Delhi are known to be generous with green chillies and coriander leaf. As the vegetables are piled on top of another, they push down a generous bunch of coriander and a handful of green chillies. This practice is unique to Delhi and does not exist in other parts of the country. 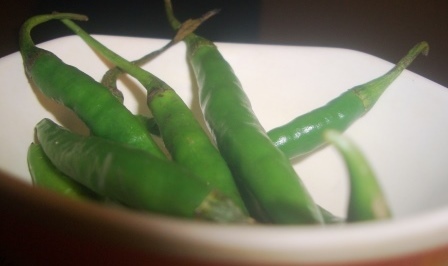 This practice often results in an abundance of green chillies in my tiny fridge. I discovered two boxes of green chillies in my fridge which I had to put to good use. The Bengali origins of lanka are unknown to me and I would be happy if somebody throws light on this; considering in Bengali one addresses pepper as golmorich. Despite its origins in the New World and its domestication in various regions of America and South Mexico, or in Peru, India too has its various versions of hot chillies available in Guntur, Coimbatore, Bombay (Mumbai), Kashmir, Assam, Nagaland. 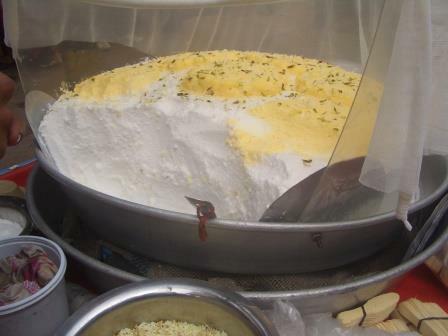 Each region has their innovative way of using chilly and West Bengal is no exception. One such popular Bengali dish (in restaurants and homes) is kancha lanka murgi – a simple dish which has flavours of green chilli to spice up a mid-week meal. Armed with 7 pieces chicken (skinless) I decided to settle for kancha lanka murgi. The ingredients are simple,7-8 pieces of chicken, one medium sized onion, twelve to fifteen garlic cloves, a slice of ginger (use according to your taste buds), and ten green chillies( the chillies that we get in Delhi are not that hot; the number should depend on the heat of the chilli so use it according to your taste), salt, turmeric, pinch of coriander powder ( adding coriander powder is a habit I have picked up from Delhi; my mother uses a combination of coriander and cumin powder) and mustard oil( I cannot think of any substitute; but for health purposes you can switch to your “healthy cooking medium”; in that case finish off the dish with a drizzle of mustard oil). Marinating the chicken: To marinate use salt (please use your discretion; I use half a tea-spoon to begin with), turmeric (a pinch) and drizzle of mustard oil and coat the chicken pieces. Keep it aside. 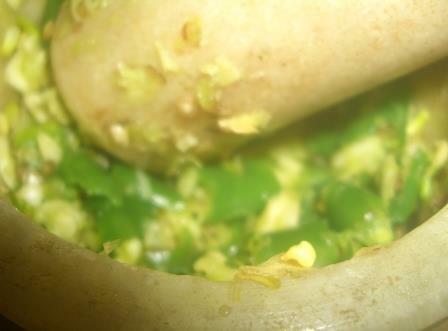 Take out the mortar pestle and pound garlic cloves, ginger and finely sliced chillies. Pound them to a coarse mix. Keep it aside. Use seven chillies and keep aside three. 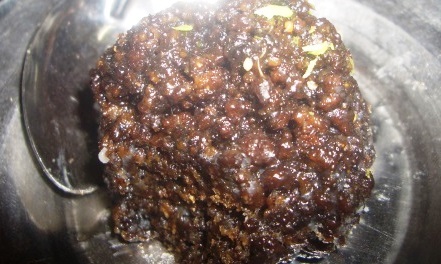 Take a kadai (wok) add mustard oil (one and a half table spoon). Once it starts bubbling, add a few (literally ten) cumin seeds, one bay leaf, a pinch of sugar (to caramelise), sliced onions and cook it well. Fry till the onion changes colour and add the ginger-garlic and chilly mix. Fry it till oil starts separating. (Increase the flame at this stage). Finally add the marinated chicken and stir it. Stirring is a very important component. As I write this recipe, I can hear my mother reminding me that the important stage of any cooking is kashano (which means cook the masala mix). Use your discretion to increase and decrease the flame at this stage of cooking. There is no need to add water still if you feel that the mix is sticking to the kadai add a small cup of hot water (one small tip rinse the mortar pestle where you have made your paste and add the water) just enough not to cover the chicken. You can make a runny gravy/ jhol but I love garo garo (which is neither runny gravy nor jhol nor shukno i.e., dry). Usually I prefer cooking in medium heat, except while heating the oil. As soon as the water starts separating, in no time your kancha-lanka murgi/ Green- Chilly Chicken would be ready. Season it well with salt (if required). Taste the dish before you pour it into a serving bowl. Finish off with slit chillies which you had kept aside and a drizzle of mustard oil. Enjoy kancha lanka murgi with rice, or roti in the coming week. There are various versions of kancha lanka murgi on other blogs. Sayak’s Kancha Lanka Murgi : http://sayakskitchen.blogspot.in/2012/12/kacha-lanka-murgi.html. Add your twist to this simple kancha lanka murgi and let me know… till then happy cooking. 1 Achaya, K.T.1998(2002). A Historical Dictionary of Indian Food. New Delhi: Oxford University Press.